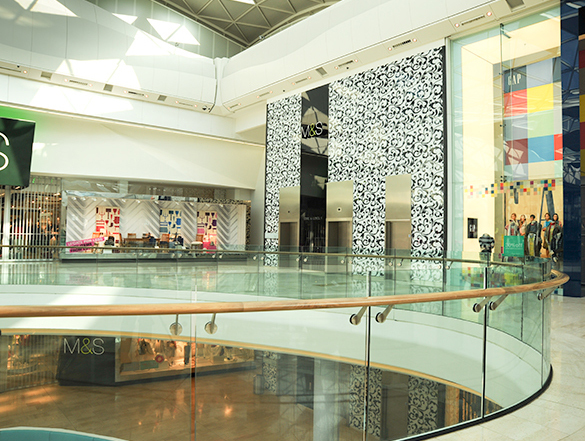 The Westfield White City development is Europe’s largest in-town retail centre. The 40 acre site houses 250 retail outlets, a 14 screen cinema and health spa. There was a requirement to create a light airy environment that, at the same time, offered a safe and secure shopping experience. The structure consists of 150,000m2 over two floors. The first floor has over 2,000 glass balustrades of which three quarters are flat and one quarter is curved. Kite Glass was selected to supply the glass for this prestigious project, as the glass was required to be curved with a structural inter layer, so that it could be used for a smoke barrier.